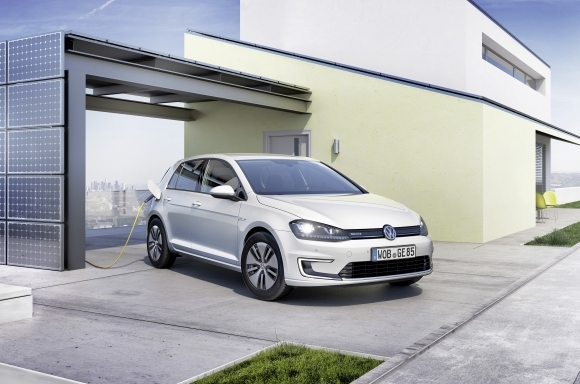 FRANKFURT/WOLFSBURG - In a double premiere at the International Motor Show (IAA) in Frankfurt am Main (10th to 22nd September) Volkswagen will be unveiling two new and extremely efficient electric cars: the e-up! and the e-Golf. The German carmaker is thus transferring two full-production bestsellers into the era of electric mobility. Both zero-emission cars are perfect for everyday use, four-door models in all cases and fully equipped. They include these standard features: automatic climate control, remote controlled parking heating/ventilation (air conditioning and heating), radio-navigation system, heated windscreen, alloy wheels, LED daytime running lights and in the case of the e-Golf all-LED headlights. They also lead the way in efficiency: in travelling 100 kilometres, the e-up! consumes just 11.7 kWh of power, making it the efficiency world champion, as no rival matches this figure. 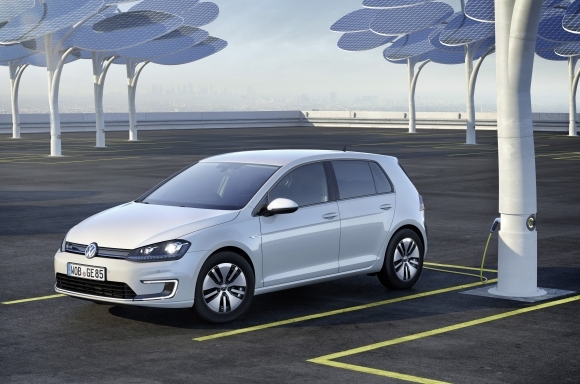 Two classes larger, the e-Golf also achieves an excellent figure of 12.7 kWh/100 km1. The result is that driving 100 km in the e-up! costs only €3.022 and with the e-Golf €3.282. Silently dynamic. Despite their great efficiency both the e-Golf and the e-up! produce a practically sporty level of performance. 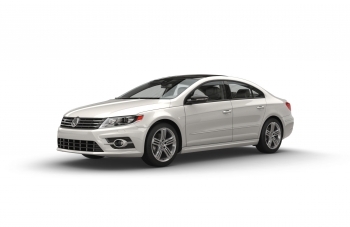 Even as cars with conventional drive systems both these Volkswagen models already have superior suspension. 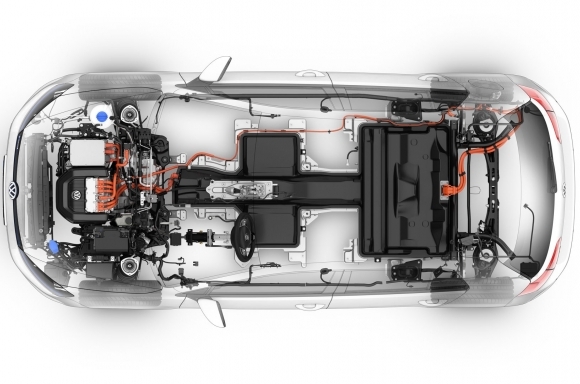 As a result of the low centre of gravity of the batteries integrated in space-saving manner within the car floor, the handling now becomes even crisper. Both newcomers also profit from a specific dynamic characteristic of electric cars: the practically silent electric motors generate a level of starting torque from standstill that is otherwise experienced only in cars of much greater horsepower. The motors, gearboxes and batteries of the e-up! and e-Golf are in-house developments, produced in German Volkswagen components plants. 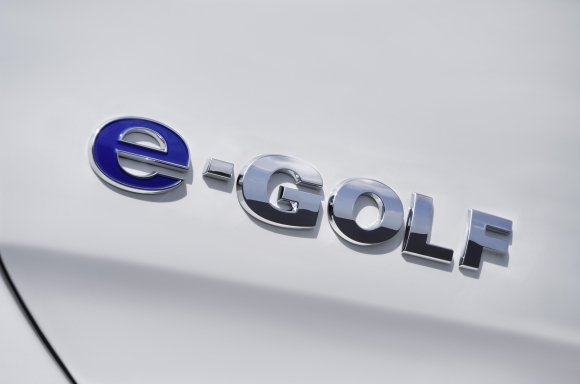 e-Golf facts and figures. The e-Golf, one of a number of cars making its world premiere in Frankfurt, is powered by an 85 kW1 / 115 PS1 electric motor. Like the motor in the e-up! it achieves speeds of up to 12,000 rpm and makes its maximum starting torque of 270 Nm available right from the off. 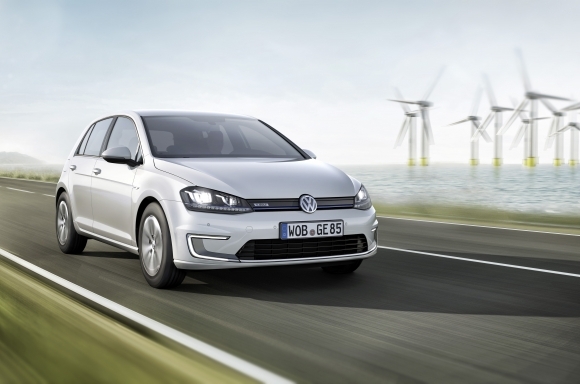 The result is that the front-wheel drive e-Golf reaches 100 km/h in 10.4 seconds. On motorways the top speed of the five-seat Volkswagen is electronically limited to 140 km/h1. e-up! facts and figures. The e-up! is also making its public debut at the IAA. 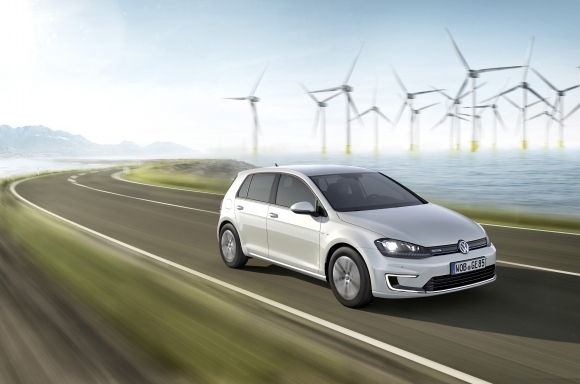 Its electric motor – as in the e-Golf a synchronous motor – produces 60 kW / 82 PS. Right from a standing start it thrusts 210 Nm onto the powered front axle. 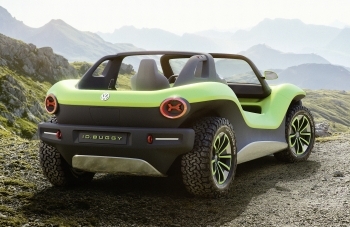 The four-seater achieves the sprint up to 60 km/h in 4.9 seconds and reaches 100 km/h within 12.4 seconds. Top speed: 130 km/h. Range levels tailored to commuters. From a single battery charge (18.7 kWh) the e-up! 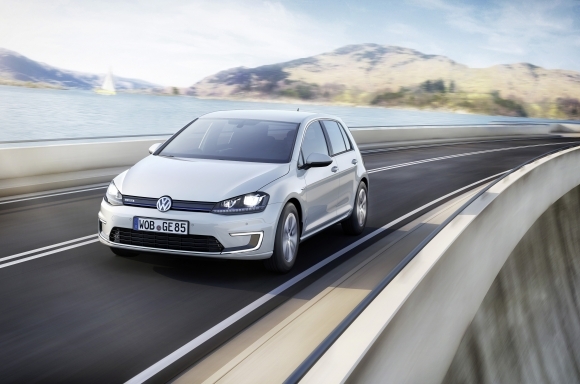 has a range of up to 160 km, while for the e-Golf, due to its larger battery (24.2 kWh), the figure is up to 190 km1. In both models three intuitive driving modes (‘Normal’, ‘Eco’ and ‘Eco+’) and four equally easy to activate levels of regenerative braking (‘D1’, ‘D2’, ‘D3’ and ‘B’) help drivers to get the maximum range out of each charge. Worth noting: research by Germany’s Federal Ministry of Transport, Building and Urban Development found that around 80 per cent of all car drivers in the country, from commuters to motorists making lots of journeys, drive less than 50 kilometres a day. Powertrain and fuel strategy. 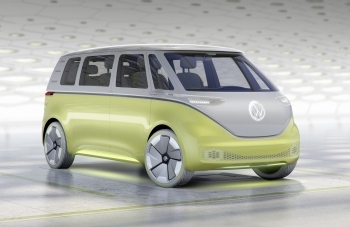 Volkswagen set out its roadmap for the future and thus also the starting point for electric vehicles such as the e-up! and e-Golf back in the past decade with a structured powertrain and fuel strategy. This strategy assigns realistic timeframes to the introduction of new, alternative drive systems, such as hybrid, electric and hydrogen. In addition, Volkswagen has made it the company’s aim to establish the brand as market leader in e-mobility (as in other areas) by 2018. 2013 is a key year for electric mobility. In the future Volkswagen will continue to rely on an intelligent mix of the most efficient drive systems. In this respect, battery electric systems – as will be shown by the new e-up! 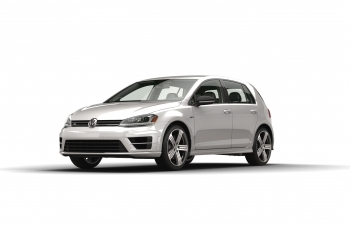 and the e-Golf – are both a sensible and essential addition. The reasons for this are obvious: first, electric vehicles enable large-scale utilisation of renewable energy sources (wind, solar, hydro) to power automobiles. For example, when it launches the e-up! 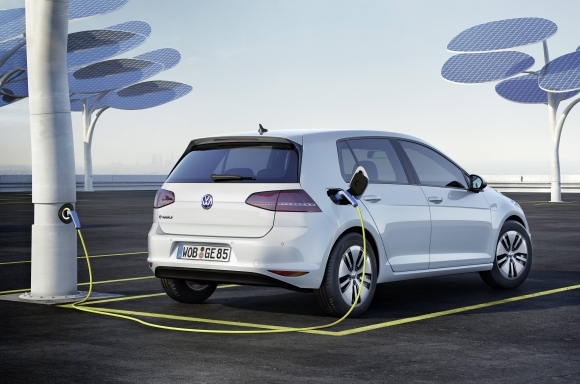 in Germany this autumn, Volkswagen will be offering the ideal electrical power for the car (“BluePower”). This energy, generated without CO2 emissions, comes exclusively from hydro-electric generating plants in Germany, Austria and Switzerland. Supply and sales partners are the German company LichtBlick SE and the Volkswagen Bank. Electric cars also offer emissions relief to metropolitan areas based on their drive technology which always features zero local emissions. Furthermore, Volkswagen’s electric vehicles are also a genuine alternative as, in terms of efficiency and recycling their battery technology, they are fully compatible with the requirements of high volume production. All drive system factors are thus now perfectly set for e-mobility to really take off. Within the framework of the company’s powertrain and fuel strategy, Volkswagen will therefore, as mentioned above, be pushing forward in parallel with the introduction of new hybrid models. 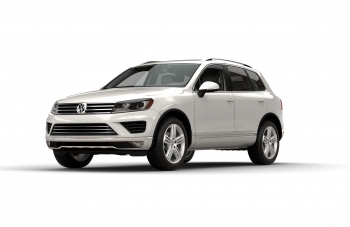 The Jetta Hybrid BlueMotion and the Touareg Hybrid BlueMotion are already in the model range. 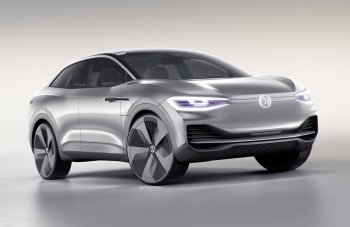 The next model of this kind due to follow next year is a Golf plug-in hybrid, which, in contrast to the standard hybrid, can also cover longer distances (50 km) solely on electric power thanks to a battery (with greater capacity) that can be charged from an external power source. Volkswagen will in addition continue to enhance its efficient petrol, diesel and gas engines (TDI, TSI, TGI), as these drive technologies will coexist long into the future. In time with big city life. The fact is that the target group for electric cars is growing, as a paradigm change has begun. A core focus of social behaviour is increasingly on sustainable mobility. But the products for putting this environmental awareness into action need to be suitable and enjoyable, like the e-up! and e-Golf, which accelerate up to the tempo of big city life in just a few seconds. The new zero-emission Volkswagens therefore have the potential to charge the electric car segment with innovative engineering, great everyday practicality and a dynamic feeling. Volkswagen is electrifying Europe’s most successful car ever: the Golf. The best seller with sales of over 30 million units to its name thus marches on to become the e-Golf with drive technology that delivers zero tailpipe emissions. Volkswagen is celebrating the world premiere of the e-Golf at the International Motor Show in Frankfurt (IAA: 10th to 22nd September). 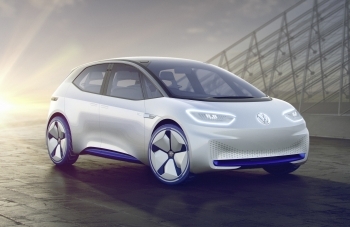 Also making its public debut at the IAA is another battery-powered electric Volkswagen, the e-up!. 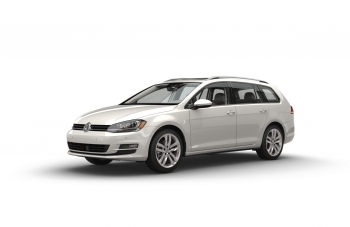 From now on, Volkswagen will thus be offering in its vehicles every form of drive system relevant in the world today. Agile and efficient. Both agile and efficient, the e-Golf demonstrates best-in-class qualities from the off, leading the way with a low power consumption figure of 12.7 kW/100 km1. Thanks to a particularly innovative overall technological system, improved aerodynamics (cD = 0.281) and perfected rolling resistance, the Volkswagen is thus 10 per cent more energy-efficient than the best steel-built direct competitor. As a result, the e-Golf will be cruising as of spring 2014 (when the European launch begins) extremely economically around the cities of the world (launches in Asia and North America follow in late 2014 / early 2015). Energy costs: around €3.28 per 100 km2. ‘Discover Pro’ radio/navigation system, a heated windscreen, automatic climate control, parking heater/ventilation, leather steering wheel) is recognisable at once by the aerodynamically optimised ‘Astana’ alloy wheels and − being used by Volkswagen for the first time − by its LED headlights (both standard on all models). The LED headlights are more energy-efficient than xenon systems, yet produce even more light. Also highly energy-efficient are the likewise standard LED daytime running lights with their C-shaped design, a signature feature of the company’s electric vehicles. Another striking feature is the bottom strip across the radiator grille. As on the Golf GTI, but in this case blue rather than red, this strip carries on into the headlights – an element that, like the ‘Think Blue.’ campaign, consciously underlines the electrically powered Golf’s environmentally friendly efficiency. A good companion in mobile everyday life. The fact that practically all of the Golf’s driver assistance systems – innovations such as ACC Adaptive Cruise Control and City Emergency Braking – are available for the e-Golf as well as the conventionally powered models underlines the fact that this Volkswagen is a very safe and exceptionally comfortable companion to take drivers into the era of zero-emission mobility. 85 kW1 and 270 Nm. 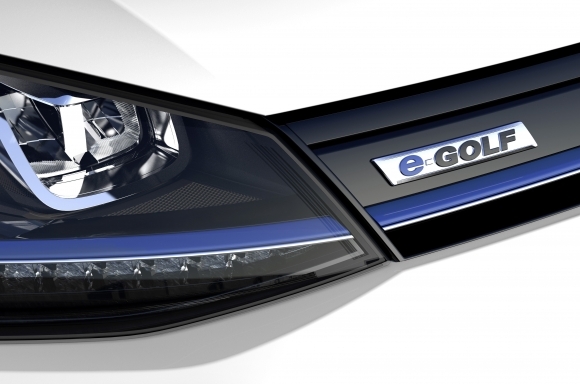 The e-Golf is powered by an 85 kW1 / 115 PS1 electric motor. From a standing start the synchronous motor, internally called the EEM 85, develops an impressive maximum torque of 270 Nm. Top performance figures are the result: the Volkswagen reaches a speed of 60 km/h within 4.2 seconds, and after just 10.4 seconds the e-Golf is up to 100 km/h. A fascinating factor here is the pull-away performance, which is extremely comfortable and totally free of any delay. On the motorway the top speed levels off, electronically limited, at 140 km/h1. Made in Germany. 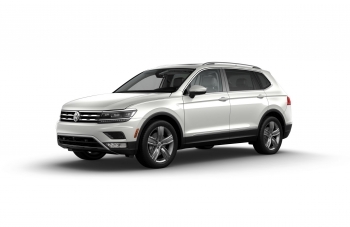 The high-performance 12,000-rpm motor and, also developed by Volkswagen, the single-speed gearbox (EQ 270) with integrated differential and mechanical parking brake form a compact module. 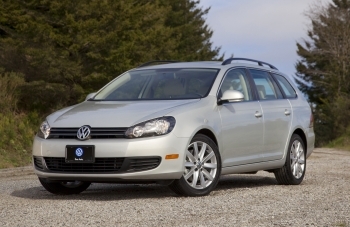 The motor/gearbox unit is made in Volkswagen’s components plant in Kassel, Germany. Up to 190 km1 on one battery charge. Depending on route profile, driving style and payload, the driving range is between 130 and 190 km1; at very low outdoor temperatures, driving range may lie below these figures. Good range will be ensured not only in fine weather but in the winter too by a newly developed, optional heat pump. Offered as an add-on module for the electric heating (high-voltage heater) and the electric air conditioning compressor, the heat pump utilises both the heat from the ambient air and the heat given off by the drive system components. In this way the high-voltage heater’s consumption of electric power is significantly reduced. 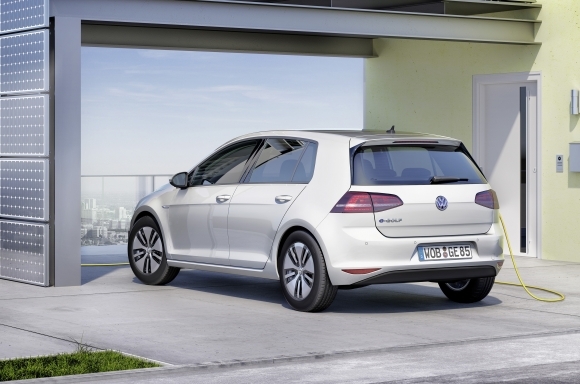 Through use of the heat pump the e-Golf’s range increases in winter by up to 20 per cent. MQB has already paved the way. The Golf Mk7 was developed from the outset as a version which could use an electric powertrain. By virtue of the innovative flexibility of the new Modular Transverse Matrix (MQB), on which the current Golf design is based, Volkswagen was able to integrate the lithium-ion battery in space-saving fashion within a stabilising frame in the vehicle floor (under the front and rear seats and in the area of the centre tunnel). 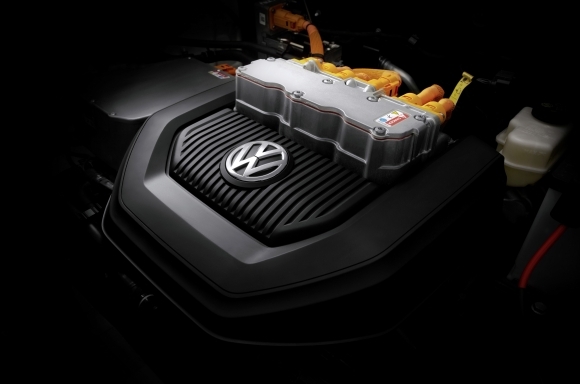 Like the motor elements of the powertrain, the battery was also developed in-house at Volkswagen. 264 cells delivering 24.2 kWh. The e-Golf has a kerb weight of 1,510 kg, of which 318 kg are accounted for by the lithium-ion battery. It is made up of a total of 264 individual cells, which are integrated into 27 modules (each with six or twelve cells). The cells add up to a nominal voltage of 323 V. Battery capacity: 24.2 kWh. The battery is fitted at the front with a battery management controller (BMC), which performs safety diagnosis and monitoring functions and also regulates the temperature balance in the battery junction controller (the interface to the motor’s energy supply). When the car is not in use or in the event of a crash, power from the battery is automatically cut off. Direct current to alternating current. A central element of the drive system is the power electronics module. Acting as the link, this module controls the flow of high-voltage energy between the e-motor and the lithium-ion battery (depending on battery voltage between 250 and up to 430 V). In the process the power electronics module converts the direct current (DC) stored in the battery into alternating current (AC). The power electronics therefore have the following interfaces: the traction circuit connection to the battery; the 3-phase connection to the e-motor; the plug connector from the DC/DC converter to the 12-V power circuit; and a connection for the high-voltage power distributor. Socket, wall box or charging station. 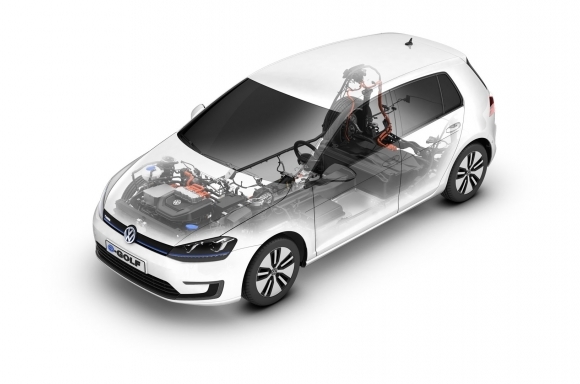 As with the smaller e-up!, there are several different ways of charging the battery in the e-Golf. As the conventional solution, the charging cable supplied as standard with the car is plugged into a 230-volt mains electrical socket. The battery of the e-Golf is charged in this way at a charge level of 2.3kW of alternating current (AC) from the mains. If it is completely flat, it will be fully charged again within a maximum of 13 hours. As an optional extra Volkswagen is offering a wall box for the garage or carport. This charges at a level of 3.6 kW. If completely flat (which in practice is rare), the battery would thus be fully charged again after around eight hours. There are also public charging stations that ‘refuel’ electric cars at a power level of 3.6 kW. 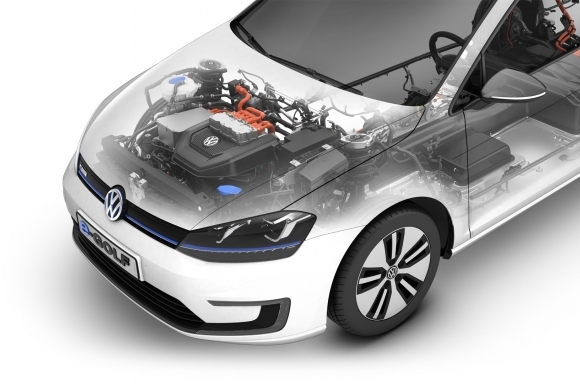 The e-Golf can also optionally be prepared for the combined charging system (CCS) using a DC power supply. 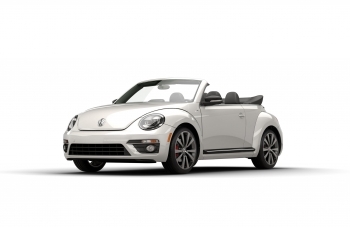 In this case the Volkswagen can be recharged via special CCS charging stations at power levels of up to 40 kW, allowing the battery to be charged to 80 per cent in around 30 minutes. 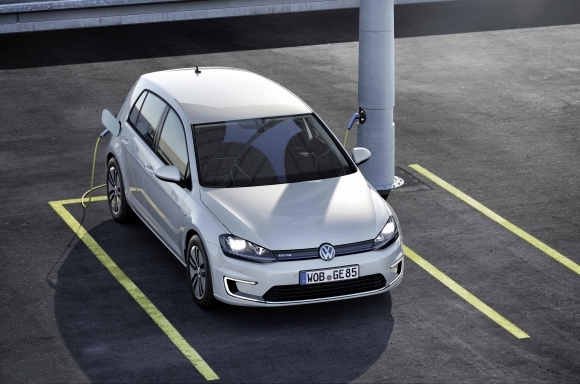 On the e-Golf the start of the charging process can be activated – immediately or delayed by programming the time – by pressing a button next to the charging socket under the ‘fuel cap’. Driving profiles and regenerative braking. Two technologies of primary importance in relation to optimal utilisation of the vehicle’s energy are the two driving profiles designed for energy economy (‘Eco’ and ‘Eco+’) and the four different levels of regenerative braking (‘D1’, ‘D2’, ‘D3, and ‘B’). ‘Eco’ and ‘Eco+’ driving profiles. 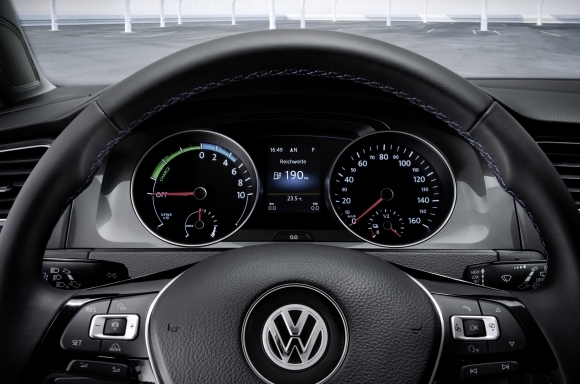 The e-Golf is equipped as standard with three driving profiles: ‘Normal’, ‘Eco’ and ‘Eco+’. The Volkswagen is automatically started in ‘Normal’ mode. For drivers wanting to extend the range, the first option is the ‘Eco’ mode. The effects of selecting this mode include paring back the e-motor’s maximum power output to 70 kW and the starting torque to 220 Nm. In parallel, the electronics reduce the output of the air conditioning system and modify the response curve of the accelerator pedal. 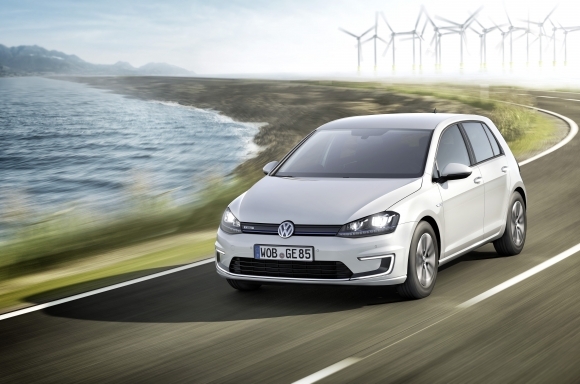 The e-Golf can now reach speeds of up to 115 km/h (in ‘Normal’ mode: 140 km/h1) and accelerate from 0 to 100 km/h in 13.1 seconds (in ‘Normal’ mode: 10.4 seconds). In ‘Eco+’ mode the electronics limit the power output to 55 kW and the starting torque to 175 Nm. At the same time the accelerator pedal response curve becomes even flatter and the air conditioning is switched off. 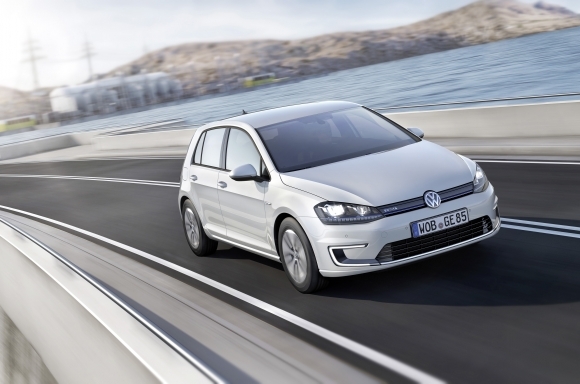 The e-Golf now reaches a top speed of 90 km/h and accelerates at a correspondingly slower rate. Nevertheless, via kick-down – in ‘Eco’ and ‘Eco+’ mode – drivers can still obtain full power, maximum torque and a top speed of 140 km/h1. Regenerative braking in settings ‘D1’, ‘D2’, ‘D3’ and ‘B’. In addition to the driving mode function, the range can also be influenced using the regenerative braking system. There are five levels available: ‘D’ (no regenerative braking), ‘D1’, D2’, ‘D3’ and ‘B’. It works like this: in gear lever setting ‘D’ the driver simply taps the gear lever knob to the left to switch to ‘D1’ (1x), ‘D2’ (2x) or ‘D3’ (3x). Tapping the knob to the right moves down the D levels. If the gear lever is pushed to the right and briefly held there, the electronics switch in one jump back to ‘D’. 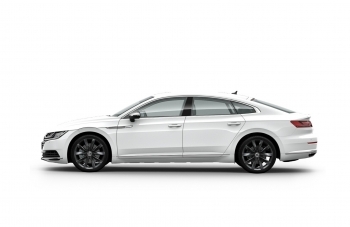 The driver activates regenerative braking level ‘B’ by pulling the gear shift lever backwards. In an electric car this number of levels leads to a different way of driving. It is possible to use regenerative braking consciously to slow the e-Golf down. Level ‘D1’ regenerates energy and slows down the car the least, while level ‘B’ has the strongest effect. At levels ‘D2’, ‘D3’ and ‘B’, the deceleration via regenerative braking is so strong that in this case the brake lights automatically come on. However, if the battery is fully charged, no energy regeneration takes place. In this case, the braking power also reduces, which the driver can feel intuitively. A fusion of brake system and motor brake. Volkswagen has developed an electromechanical brake servo for its electric cars. This optimises the driver’s braking force in the same way that brake servos do in conventional cars. In the case of the electromechanical brake servo, however, this happens via what is known as ‘brake blending’ – a process in which low levels of deceleration are produced solely through the e-motor’s braking torque. Stronger deceleration, meanwhile, is achieved through joint braking torque from the electric motor and the hydraulic brake system. Air drag reduced by 10 per cent. By developing very specific measures such as reducing the volume of cooling air (via a radiator shutter and partially enclosed radiator grille), new underbody panelling, modification of the tail with a rear spoiler and C-pillar air guides, and by developing new aerodynamic wheels (largely closing off the wheel openings flush with the car’s exterior), Volkswagen was able to lower the Golf’s air drag. Whereas on the standard Golf (1.6 TDI with 77 kW) air drag is 0.686 m², the company was able to reduce this to 0.615 m² on the e-Golf, thus improving it by 10 per cent. Similarly, the cD value was improved to 0.281. Rolling resistance reduced by 10 per cent. Volkswagen was able to achieve another positive effect on energy consumption and range through optimisation of the tyres (205/55 R16 91 Q). 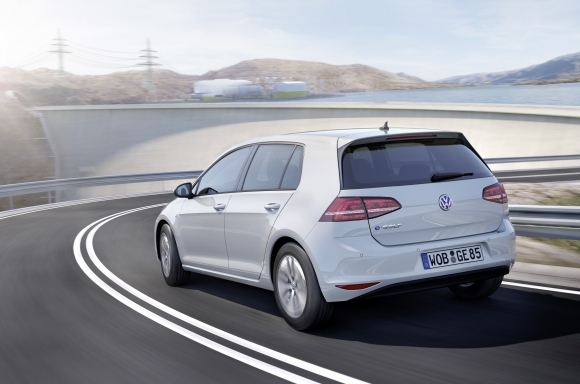 Reducing the rolling resistance coefficient from 7.2 per 1,000 (Golf BlueMotion) to 6.5 per 1,000 for the e-Golf (likewise an improvement of 10 per cent) also improves the range. E-drive systems are a challenge. Electric drive systems present a challenge in relation to acoustics. The reason for this is that as a result of the absence of any internal combustion engine very different sources of noise become noticeable. In addition, the scarcely perceptible and yet very specific background noise of the drive system is joined by the sounds and vibrations of the electrically powered auxiliary components. Last but not least, without any fine tuning, wind and rolling sounds are much more noticeable in electric vehicles, as they are in luxury cars. As quiet as a luxury car. Against this background Volkswagen implemented an acoustic concept for the e-Golf that is specifically tailored to the characteristics of an electric vehicle, making the zero-emission car into an almost silent cruiser. 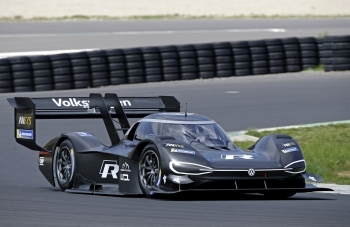 A few examples: the powerplant suspension system was switched to a pendulum mount with modified response characteristics, which despite the e-motor’s high build-up of torque when accelerating greatly enhances the acoustics. Through the design of the motor housing unit Volkswagen was also able to achieve an extremely low level of noise emission. Furthermore the highly sound-absorbent and yet very lightweight materials used in the interior produce such a high level of acoustic comfort that occupants of the e-Golf, itself already a high quality car, feel as though they are riding in a vehicle from the luxury class. First Volkswagen with all-LED headlights. Visually the unique, always four-door e-Golf can be recognised even from a distance by its especially energy-efficient all-LED headlights, being used here as a world first. Compared to xenon headlights the LED system produces more light despite consuming less power. 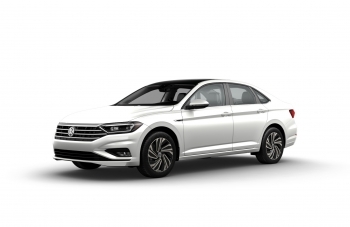 From now on, an identifying feature of Volkswagen electric cars will be the C-shaped designer signature of the LED daytime running lights in the redesigned front bumper. At the rear, the latest Golf can be made out as a zero-emission car by such features as the absence of any exhaust pipes. In addition appropriate model name markings and the VW logo with a blue background also show that the e-Golf is a zero-emission vehicle. Also standard on the car’s exterior, as mentioned above, are LED rear lights and the aerodynamically perfectly balanced 16-inch alloy wheels with 205 tyres optimised for low rolling resistance. Exclusive standard equipment. In addition to the specific fabric design (seats in the ‘Merlin e-grey / Clip titanium black’ pattern; optionally leather) and the extremely good level of standard equipment (incl. 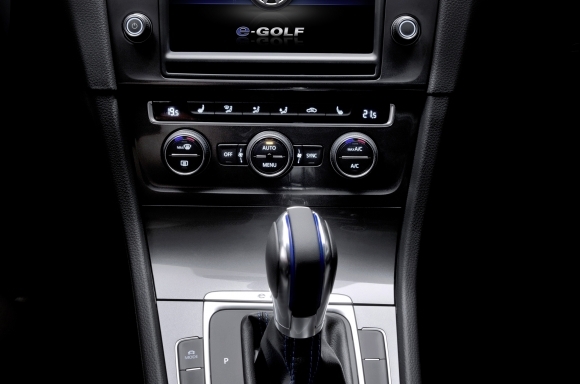 automatic climate control, parking heater/ventilation, high-end Discover Pro radio-navigation system, heated windscreen, leather steering wheel, leather gear knob and elegant ‘Iridium Matrix / Dark Magnesium’ trim) striking features in the interior of the e-Golf include the new instrument layout and the touchscreen in the centre console, which is also equipped with new functions. In line with the exterior, the interior is also enhanced by blue elements, including the decorative seams of the leather steering wheel and gear knob, plus the floor-mat edgings. As an option the so-called ‘Ambience pack’ creates a link with the world of ‘Think Blue.’: it contains LED reading lights, blue footwell illumination, blue ambient lighting around the decorative trim and, of course, door-sill tread plates also illuminated in blue. Power display replaces rev counter. On the left-hand side of the instrument cluster the rev counter is replaced by the power display (which indicates if the motor is ready, the battery is being charged via regenerative braking or power is being drawn off) and the indicator of output availability. Still on the right as a corresponding instrument is the speedometer, in this case going up to 160 km/h. Added to the bottom section of the speedometer is an indicator showing the charge level of the high-voltage battery. On the colour display (premium multifunction display) between the power display and the speedometer, features now include a permanent indication of the driving range, of the currently active level of regenerative braking and an indication of the remaining charging time and of the type of charging connection. In a separate LED field in the lower segment of the multifunction display, the ‘READY’ message also appears after starting the motor, indicating readiness for the car to be driven. Touchscreen. Every Golf is equipped with a touchscreen. In the case of the e-Golf it is the range’s premium display, the top ‘Discover Pro’ radio/navigation system’s 8-inch touchscreen. 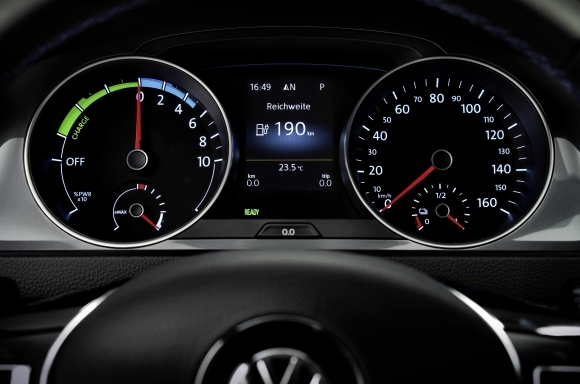 In the e-Golf the system now shows numerous new functions. Example 1 - Range monitor: this provides a graphic illustration of the vehicle’s current range. The range potential of any auxiliary consumers is also displayed, as by switching off the consumer units shown to be on, the driver can gain extra range. Example 2 - Energy flow indicator: by means of animated graphics this depicts the energy flow when accelerating (blue arrows) and when applying the brake that involves regenerative braking (green arrows). Meanwhile, regenerative braking statistics provide information on the amount of energy recovered since the start of the journey. Example 3 - e-manager: this enables drivers to pre-programme up to three departure and charging times. At the defined time the vehicle ensures the set air conditioning and battery charge level. The heating or cooling of the interior can also be activated via parking heater/ventilation (fitted as standard) during the charging process. The air conditioning process thus does not have any effect on the charging of the battery which extends the range. Example 4 - 360° range: the current radius of the e-Golf is shown by the so-called 360° range on the map of the surrounding area. The inner area represents the potential zone for a return trip. The outer area, on the other hand, represents the range for a one-way journey. Charging stations can be displayed and integrated into the route as intermediary destinations. Programming of the departure time – Functions that are scheduled according to the programmed departure time include the the park heater/ventilation function; it is started at a specific time that depends on the outdoor temperature, so that the desired interior temperature is reached by the programmed departure time. Climate control – Starting and stopping the auxiliary climate control function, plus display of the outside temperature and the target temperature for the car’s interior. Charging the battery – Starting and stopping the charging process, indicating charger connection status, charge status, charge progress, charge level, charge start time and range. Accessing vehicle data – Information display relating to individual journeys (single trips or long term), such as kilometres driven, journey time, electric motor power consumption, power consumption of other consumers such as air conditioning and radio, use of regenerative braking. Vehicle status queries – Doors and boot locked, lights (on/off), charging cable plugged in, position where the e-Golf was last parked (GPS position on a map). From the middle of October, Volkswagen will be supercharging its model range with the brand’s first electric vehicle: the new e-up!. Creating a double impact on the e-mobility stage, the four-door city specialist will be followed just a few months later, in spring 2014 (launch in Germany), by a further zero-emission Volkswagen: the e-Golf. 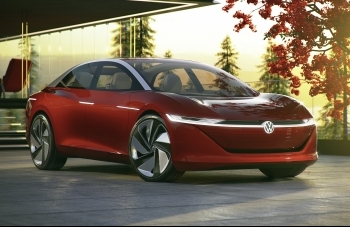 Both electric cars will make their debut at the International Motor Show (IAA) in Frankfurt (10th to 22nd September), heralding the era of full-production e-mobility for Volkswagen. 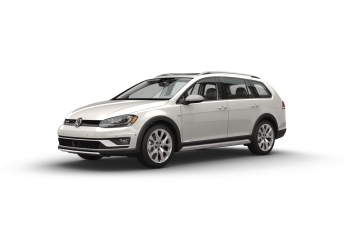 Henceforth Volkswagen will thus be offering in its vehicles every form of drive system relevant in the world today. Low ‘fuel costs’. The launch of the e-up! marks the introduction of a next generation electric vehicle that thanks to an armada of innovative detailed solutions uses energy extremely economically. The e-up! consumes, for instance, just 11.7 kWh/100 km. At an average electricity price of 25.8 cents (Germany, July 2013), driving 100 kilometres costs just €3.02. Perfection in the detail. The pioneering efficiency of the e-up! is attributable to the very good cD value for a car of this size of 0.308 (4 per cent lower than the take up! ), optimised rolling resistance (7per cent lower), the generally energy-saving drive system components, the highly effective regenerative braking system, innovative equipment modules and a newly developed, particularly efficient air-conditioning system. Made in Germany. A compact electric motor (60 kW / 82 PS and 210 Nm starting torque), the lithium-ion battery integrated into the floor and the power electronics form the hub of the new high-tech car’s drive system. The electric motor’s power is transferred to the front wheels via a single-speed gearbox. 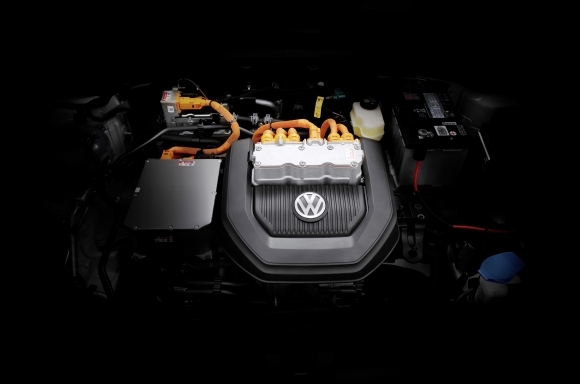 Volkswagen itself developed all of the components, including the battery. With a top speed of 130 km/h, the average range of the e-up!, dependent on route profile, driving style and payload, is between 120 and 160 km; at very low outdoor temperatures the range may be less. These range distances work especially well in urban areas and for the majority of commuters. In Germany, for example, studies by the Federal Ministry for Transport, Building and Urban Development found that around 80 per cent of all car drivers in Germany – from job commuters to drivers who make frequent journeys – drive fewer than 50 km daily. 0–60 km/h in 4.9 seconds. After 4.9 seconds the e-up! is going at a speed of 60 km/h; within 12.4 seconds it’s 100 km/h. In 10.5 seconds it accelerates from 80 to 120 km/h. Top speed is 130 km/h. By way of comparison: the most powerful conventional e-up! (with 55 kW / 75 PS) accelerates from 0 to 100 km/h in 13.2 seconds and from 80 to 120 km/h in fourth gear in 15.5 seconds. The comparison shows that the e-up! blows away prejudiced views about the performance of electric cars. 204 cells in 17 modules. The lithium-ion battery fitted in the e-up! into the vehicle floor weighs 230 kg and is made up of 17 modules, each with 12 cells. These 204 cells add up to a rated voltage of 374 V and rated power of 18.7 kWh. At peak level the cells provide an effective power output of 75 kW and over a continual period 35 kW. The cell modules of the battery, measuring 1,726 mm long, 1,132 mm wide and 303 mm at its highest point, have been integrated, as already indicated, in space-saving fashion within the floor of the e-up!. Compared to other lithium-ion cells (e.g. from the field of consumer electronics), the battery system’s cells are particularly resistant to heat and cold, meaning that no separate battery cooling or heating is required. 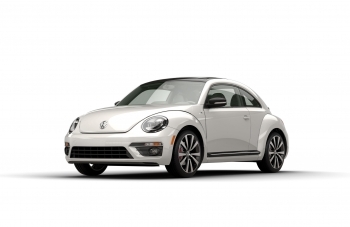 Like the electric motor and the gearbox, the battery system, battery electronics and the relevant control software were also developed in-house at Volkswagen. Energy flow interface. Another central element of the drive system is what is known as the power electronics. This complex module weighs 10.5 kg in the e-up! and, acting as the link, controls the flow of high-voltage power between the e-motor and the lithium-ion battery (depending on battery voltage between 296 and up to 418 V). In doing so the power electronics convert the direct current (DC) stored in the battery into alternating current (AC) and use this to drive the motor. Via a DC/DC converter it also supplies the vehicle’s circuitry with voltage of 12 V.
Phase and traction cables. The power electronics module is connected to the e-motor via the sort of yellow-and-orange 3-phase cable typical for electric vehicles. The connection to the lithium-ion battery is established via two traction cables. Direct current becomes alternating current. In respect of the all-controlling power electronics a distinction has to be made between two fundamentally different modes in which the e-motor operates: motor mode (propulsion) and generator mode (regenerative braking). In motor mode the power electronics use high-power transistors to convert the direct current (DC) stored in the battery into 3-phase alternating current (AC). In generator mode, meanwhile, the alternating current is rectified for charging the battery. In this scenario the power electronics resemble in terms of their task a valve that lets the electrical current flow only towards the battery to be charged. This maximum phase current of the power electronics is limited in the e-up! to 385 A. A fusion of brake system and motor brake. Electric cars are essentially equipped with two brake systems independent of each other: on the one hand, as in conventional cars, a mechanical, hydraulically operated brake system is there to slow the car down. At the same time, however, the e-motor acts when recovering energy as a motor brake. These two types of braking now blend together in the e-up! thanks to the electromechanical brake servo. The brake servo’s task. Regardless of regeneration mode (‘D1’, ‘D2’, ‘D3’ or ‘B’), when operating as a generator the electric motor generates a degree of braking torque on the wheels – dependent on its speed and the battery’s temperature and charge level. variable parameters – motor speed and battery state – lead to fluctuating levels of electric braking. These fluctuations need to be hydraulically compensated and the degree of deceleration matched in this way to the braking performance called for by the driver. The management of the brake system required for this is called brake blending and is achieved via the new electromechanical brake servo. Volkswagen has succeeded here in its primary aim of making maximum utilisation of the e-motor’s potential to slow down the e-up! in order to increase its range. Less wear on the brakes. As the majority of braking processes involve only minor or moderate deceleration and are therefore executed without any wear via the e- motor, the electric system helps to keep the ‘normal’ brakes in top condition longer. A question of style. The other specific functions of the e-up! used while driving the car are practically self-explanatory. You have to think of the car’s tank as a battery filled with electrical energy that empties during the journey. The faster you drive or the more you accelerate, the greater the amount of energy consumed. However, as the driver you have considerable influence over this level of consumption and thus over the range. The e-up! is able to switch off temporarily unneeded consumers and in general to transform kinetic energy – produced when coasting or by braking – into electrical energy and to store it in the battery. Two economy profiles: ‘Eco’ and ‘Eco+’. The range of the e-up! can be varied via three different driving style profiles: the standard mode (automatically on), ‘Eco’ and ‘Eco+’. Anyone nipping around travelling short distances, will stay in standard mode. For drivers wanting to extend the range, the first option is the ‘Eco’ mode. The effects of selecting this mode include paring back the e-vehicle’s maximum power output to 50 kW and limiting its top speed to 115 km/h. In parallel with that the electronics reduce the output of the air-conditioning system and modify the response curve of the accelerator pedal. In ‘Eco+’ mode the electronics limit maximum power output to 40 kW, modify the performance response curve and disable the air conditioning; in this mode the car can reach a top speed of 90 km/h. Regenerative braking in D1, D2, D3 and B. Over and above the driving style modes the range of the e-up! can be influenced via the regenerative braking function. There are no fewer than five levels available: ‘D’ (regeneration via electromechanical brake servo only when applying the brake), ‘D1’, D2’, ‘D3’ and ‘B’. In an electric car this number of levels leads to a different way of driving. By means of regenerative braking drivers can appreciably slow down the e-up! by lifting their foot off the accelerator. Used in an anticipatory way, regenerative braking thus replaces use of the brake pedal in many situations. At levels ‘D2’, ‘D3’ and ‘B’, the deceleration via regenerative braking is so strong that in this case the brake lights automatically come on. If the battery is fully charged, no regenerative braking occurs. Plugs, wall box and charging stations. To recharge the e-up! you simply connect it to the mains. However, there are various ways that this can be done. The simplest option is to plug the mains charging cable supplied with the car into a conventional 230-volt socket. The battery is then charged from the mains at a power level of 2.3 kW. A completely flat battery is recharged in this way within nine hours. As an option Volkswagen offers a wall box for the garage that charges the battery at a power level of 3.6 kW. The (completely flat) battery would thus be fully recharged after six hours. There are also public charging stations that ‘refuel’ electric cars at a power level of 3.6 kW. As a new car the e-up! can also be prepared for the combined charging system (CCS) using a DC power supply. In this case it can alternatively be ‘refuelled’ via special CCS charging stations at power levels of up to 40 kW. The battery is then 80 per cent recharged after just 30 minutes. Ready to drive. The new e-up! 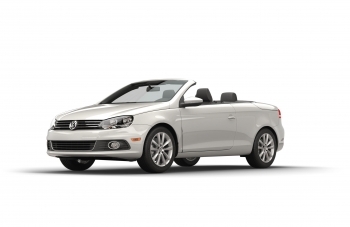 is first and foremost a Volkswagen. And that means that like all other versions of this specialist city car the electrically powered version is also fully intuitive to drive, reliable and safe. Everything begins as it always begins. Get in, buckle up, foot on the brake, start the motor. In cars with internal combustion you now hear the engine, while the rev counter’s needle also shows that things are happening. In the e-up! nothing like that occurs. Although the electric motor is indeed on, it produces neither noise nor vibrations. And as for the rev counter, there is none. The e-up! signals its readiness to its driver via routines specially designed for the purpose. When the car is started and ready to go, the speedometer needle pegs to the end stop once and then returns to the home position. The illumination of the indicators on the e-up! instrument panel is also switched on, regardless of whether the car’s outside lights are on or not. At the same time the battery charge indicator rotates to the current level and the power indicator moves from ‘Off’ to ‘0’. Last but not least, the word ‘Ready’ appears in the panel’s central display, backed up by an audible signal. The zero-emission journey can now begin! Range display. The e-up! 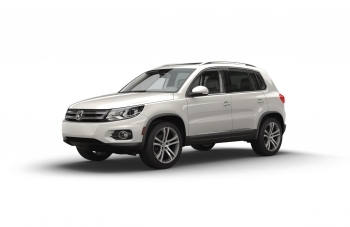 comes as standard with the portable maps + more navigation system, complete with Bluetooth hands-free facility. In the e-up! it provides numerous new functions, such as range display (‘360° range’). In this mode a map of the surrounding region shows the radius of the area that can be reached with the current level of charge. Here too there are several different functions: ‘One-way range’ (route in one direction), ‘Range including return’ (route there and back) and ‘Combined’ (both range options). Charging stations via POI. Whenever a destination is entered into the navigation system the driver is informed (via a newly devised range warning system) whether the distance is possible with the current level of battery charge; if not, appropriate stops can be scheduled via the charging stations shown in the points of interest (POIs). A single, one-way route thus becomes a multi-stop route. Drivers are also able to save their own and new charging stations on the system and integrate these into their route planning. Cleverly managed. Among the other maps + more functions and displays specific to the e-up! are the power flow and regenerative braking display and an e-manager. Using the e-manager, drivers can pre-programme the charge start time and climate control pre-conditioning (switching on the parking heater in winter or parking air conditioning in summer for up to 30 minutes; if not plugged into a charger for up to 10 minutes). The advantage of having the car’s interior warmed up or cooled down while the battery is being charged (apart from the added comfort) is that you do not affect the battery’s charge level by any initial heating or cooling before starting up. As a result the battery’s full range is available to you as you start your journey. Programming of the departure time – Functions that are scheduled according to the programmed departure time include the park heater/ventilation function; it is started at a specific time that depends on the outdoor temperature, so that the desired interior temperature is reached by the programmed departure time. Climate control – Starting and stopping the parking heater/ventilation function, plus display of the outside temperature and the target temperature for the car’s interior. Charging the battery – Starting and stopping the charging process, charging connection display, charge status, charge progress, charge level, charge time and range. 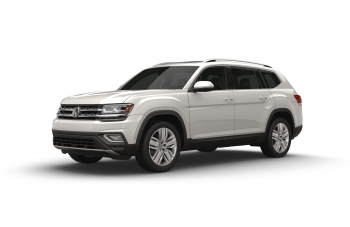 Requesting vehicle status – Doors and boot locked, lights (on/off), charging cable plugged in, battery charge level, range, position where the e-up! was last parked (GPS position on a map).